Our M&A decomposition analysis reveals that AMC Entertainment's acquisition of Carmike has yielded little to no value accretion. Moreover, recliner seat investment has reached its late-stage domestically, implying marginal ROI (domestic EBITDA upside) has diminished considerably. A-List initiative (movie-going subscription) is unlikely to be a game changer in terms of boosting EBITDA, in our opinion. The pace of international expansions seems to be clouded by Brexit/macro concerns. AMC stock is likely to be a value trap as we foresee flattish EBITDA growth prospect. We take a close look at AMC Entertainment (AMC) as the company passes our stock screener as a value stock. Specifically, the stock trades at a cheap 7.3x 2019E EV/EBITDA. AMC is the largest movie chain theater in the US. As of Dec. 2018, the company operates 637 theaters/8,114 screens. In addition, through acquisition of Odeon and Nordic in 2016-17, AMC has established European presence, consisting of 369 theaters/2,668 screens. Hence, in this note, we would like to evaluate whether value has emerged for AMC or its cheap valuation is simply a value trap. Back in Dec. 2016, AMC completed the acquisition of Carmike Cinemas for US$858 mn, consisting of US$584 mn cash and 8.19 mn new shares then valued at US$274 mn. More than two years have passed (two full years of Carmike figures have been consolidated). Based on our M&A decomposition analysis (separating sales and EBITDA into AMC ex-Carmike and Carmike, see Table 1), we found that, unfortunately, the acquisition has yielded little to no value accretion. Specifically, based on combined AMC ex-Carmike and Carmike figures, adjusted EBITDA (with M&A related costs added back) has barely changed in 2018 (US$700 mn), from 2016 (US$692 mn) when each was a stand-alone company. This means that during the span of two years, there has been little to no cost synergy. We would expect that 3-7% of combined sales are normal cost savings from any horizontal acquisition (in AMC-Carmike M&A, this should translate into US$26-60 mn cost savings). Of note, we derive combined AMC ex-Carmike and Carmike figures from domestic EBITDA in 2017-18 (as Carmike has been fully consolidated) while prior to 2017, we simply add AMC's domestic EBITDA and Carmike's EBITDA (as they each were still stand-alone companies). In fact, in 2017, combined EBITDA dipped to US$610 mn, from US$692 mn in 2016. During 4Q18 earnings call's Q&A session, management did admit that the integration process had not been smooth and Carmike assets when handed to AMC in Dec. 2016 were in eroding positions. Management further explained that they put a restructuring team to fix Carmike assets and only in Sept./Oct. 2017, Carmike's performance had finally bottomed out. From Nov. 2017 onwards, the performance had begun to improve and only in 2018, management managed to install 14 former Carmike theaters with recliner seats (expansion strategy replicated from AMC ex-Carmike assets). Hence, our verdict for AMC's acquisition of Carmike is little to no value accretion. Another way of looking at this is that AMC has overpaid for Carmike assets. Based on the acquisition price of US$858 mn plus US$355 mn net debt, the acquisition was acquired at an expensive 10-11x post-M&A EBITDA multiple (especially since there had been little to no cost synergy). Domestically, since 2012-13, AMC's big expansion story has been converting existing old theaters into ones with recliner seats to provide customers greater comfort and convenience. As of Dec. 2018, the number of domestic theaters/screens with recliner seats has reached 305 theaters/2,900 screens, from only 35 theaters/396 screens as of Dec. 2013. Though the counts of domestic theaters/screens with recliner seats only account for 48%/6% of total as of Dec. 2018, management stated during 4Q18 earnings call, recliner seat expansion in the US has reached its late stage. This is because the 305 theaters/2,900 screens with recliner seats have accounted for 75%/55% of AMC branded ones (ex-Carmike theaters). Moreover, regarding ex-Carmike theaters (250 theaters), management explained that possibly two thirds of ex-Carmike theaters would not be converted into ones with recliner seats. This is because these theaters are too small and the visitations are too light to justify recliner seat investment. Hence, of 250 ex-Carmike theaters, approximately only 80 theaters are recliner seat candidates (14 has been renovated in 2018). So, going forward, domestically, AMC has around 66 theaters to install with recliner seats. This implies 1.5 (max 2 years) left considering installment pace of 50 theaters pa with recliner re-seats last five years. What is more disheartening to us is that EBITDA margin increment from theaters with recliner seats does not provide as much boost as expected and has plateaued in the last few years. A case in point, EBITDA margin for AMC ex-Carmike assets improved considerably from 16.3% in 2013 to 18.3-18.4% in 2015-16. However, since then, EBITDA margin for AMC ex-Carmike assets has pretty much hovered around this level (18-18.6% in 2017-18). This implies that marginal EBITDA margin (thus marginal ROI) from theaters with recliner seats has diminished considerably, from that in its initial expansion stage. This though is understandable since it is the law of diminishing return from greater supply. Going forward, the not-so-pleasant implication for AMC is that there is limited room for domestic EBITDA upside as recliner seat expansion domestically has been in the late cycle. In late June 2018, AMC came up with a new initiative called "AMC Stubs A-List", which is essentially a movie-going subscription. The members would pay a fixed monthly price (US$19.99/mo for seeing movies up to 3 times/week). As of latest data (Feb. 2018), management disclosed that there are 700K A-List subscribers. First and foremost, this initiative has generated quite a controversy (or investors' confusion, mildly put) of whether it is profitable considering the A-List is essentially an admission price cut. Moreover, investors have seen the episode where the pioneer of movie-going subscription, MoviePass owner, Helios & Matheson Analytics (HMNY), is a technically bankrupt company (with monthly cash burn rate of US$40-50 mn and HMNY frantically looking for funding constantly). Nonetheless, management has defended A-List initiative as a very different subscription, notably with subscription price more than doubling MoviePass's. Moreover, management stated during 3Q18 earnings call that A-List initiative is profitable given much higher subscription prices and AMC being the theater (as opposed to MoviePass who has to pay theaters at a regular admission price whenever its members go to see movies). The question management posed is that if it is EBITDA increment over a scenario of no such program. Management, in fact, is getting more bullish about A-List initiative during 4Q18 earnings call. According to management, with average price increases of 13% effective mid-Jan. for new members and 1-yr renewal in late June, A-List would generate US$15-25 mn incremental adjusted EBITDA for full year 2019 (instead of break-even scenario management predicted during 3Q18 earnings call). This assumes 1 mn members at movie-going frequency of 2.5x per month. As a sensitivity analysis, for every move of 0.25x in movie-going frequency, incremental adjusted EBITDA would change by US$10-15 mn. In Jan.-Feb., average movie-going frequency has gone down to 2.8x visits, from 3.4x visits in the first full month of membership. Our view on US$15-25 incremental adjusted EBITDA for 2019 (provided by management) is that we do not buy that (yet). First, as stated, average movie-going frequency for members in Jan.-Feb. remains at 2.8x per month. Note that management commented that the frequency started out high in the first month and then quickly settled down by the 3rd and 4th month. This implies that there is no guarantee nor easy path of the movie-going frequency coming down to 2.5x per month as Jan. and Feb. 2019 are already the 7th and 8th month of A-List since its inception. Second, 4Q18 domestic adjusted EBITDA margin was only 16.1% despite breaking US$1 bn quarterly revenue (seasonally high quarter). Normally, in a seasonally high quarter, AMC's domestic adjusted EBITDA margins would be 20% plus given its high operating leverage. The 16% domestic adjusted EBITDA margin, in our opinion, partly reflects a margin drag from A-List initiative. Furthermore, big-picture wise, we opine that A-List initiative is not a game changer especially in terms of boosting AMC's EBITDA. Even assuming management's prediction (1 mn members generated US$15-25 mn incremental adjusted EBITDA in 2019) comes true, the 15-25 mn incremental adjusted EBITDA represents only 1.6-2.7% increment to 2019 consensus EBITDA forecast. This is certainly not an exciting consensus EBITDA upward revision story. What's left in terms of growth story? Let's recap quickly. Management has stated that domestic expansion story in terms of recliner seat installation has reached its late stage. Moreover, we have reservations on domestic EBITDA upside since domestic EBITDA margins boost from recliner seat investment has plateaued last couple of years. And, we do not see A-List initiatives as a game changer in boosting EBITDA. Given its acquisition of European assets in 2016-17, AMC had a quarter of sales and EBITDA coming from international market in 2018. The expansion story for European assets is replication of recliner seat investment ala the US assets. As of Dec. 2018, internationally, AMC has 24 theaters/230 screens with recliner seats, pretty similar to US assets' early stage as of Dec. 2013. However, we are a bit puzzled with the investment pace management has indicated for European assets in 2019: 20-25 theaters with recliner seats vs. 50-55 theaters pa in the US asset's early stage. To us, this means that management is cautious on the ROI of recliner seats or the acceptance of European customers toward recliner seats (compared to the US customers). Or, it could simply be Brexit macro concerns as UK accounts for 40% of European revenue. International adjusted EBITDA margins stood at 15.8% (vs. domestic adjusted EBITDA margins of 17.5% or 18.6% adjusted EBITDA margins for AMC branded theaters). This implies that there is room for margin expansion for international operations. However, given the slower investment pace mentioned earlier (plus Brexit uncertainty), we think that international adjusted EBITDA margin expansion would be slower in coming as well. Our mini earning model suggests that 100 bps margin expansion (still an if) in international operation would result in only US$14-15 mn incremental adjusted EBITDA. This represents immaterial 1.5-1.6% EBITDA boost to AMC's 2019 consensus EBITDA. 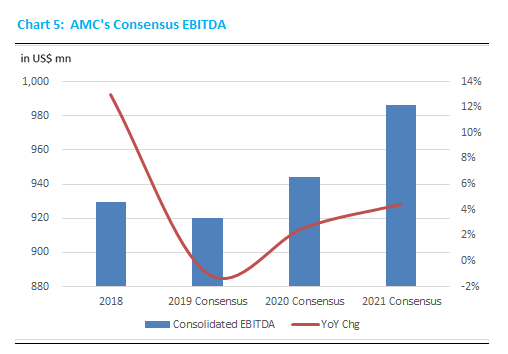 Having reviewed AMC's fundamentals, unfortunately, we do not see compelling growth story for next couple of years notably as we have reservations on EBITDA margin expansion/upside coming from domestic or international operations. Management's efforts in recliner seat investments and A-List initiative are noted, but fundamental headwinds (late-stage investment for US assets, Brexit macro concerns for European assets) are simply too strong to overcome. Our mini earnings model suggests that we are principally in agreement with consensus growth assessment (1% EBITDA CAGR in 2018-20E). As pointed out, the likelihood of material consensus EBITDA upward revision (thus changing AMC's growth story considerably) is slim. Trading at 7.3x 2019 EV/EBITDA is cheap, needless to say. But, without compelling fundamental/growth catalysts, AMC stock is likely to be a value trap for next 12 months, in our opinion.